Well, spring has definitely sprung here in the low desert, with numerous bees, wasps, and spiders now active. One of the more conspicuous visitors to the yard is the Paper Wasp. In fact, they've enjoyed my yard so much one decided to take up residence in the frame of my front door! 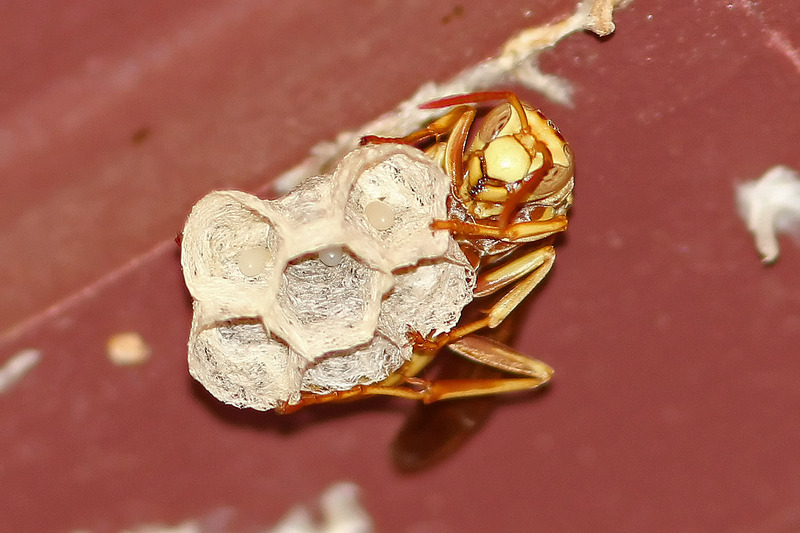 The photo shows a wasp tending to a newly built nest. The nest looks a bit like paper (thus the wasp's common name). If you enlarge the photo you will see small white eggs in each of the chambers of the nest. Paper wasps are known for building there nests on man-made structures, often in conspicuous locations. Why? I have no idea but I'm certain some scientist somewhere has given this thought. It certainly doesn't seem like a good survival strategy to build where people will see you! Any theories from anyone? But fascinated by your image. They are so industrious. Wish not quite so aggressive. I think it's perhaps availability of tasty, chewable, soft wood! What a great shot that is - couldn't be clearer, or better framed! You've captured some fabulous details! Happy Macro Monday. Amazing shot! Wasps are not cuddly creatures, but they are interesting, and, if not threatened, will mind their own business. But a door frame is not a good spot if they are to be left alone!